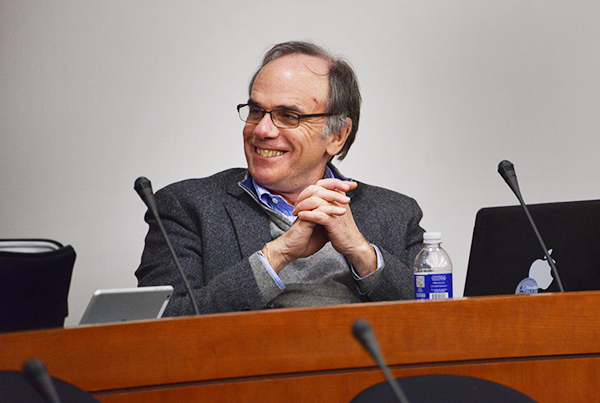 Michael Feuer, dean of the Graduate School of Education and Human Development, sits in a Faculty Senate meeting Friday. The dean is planning to open more doors to undergraduates and Ph.D. students in GSEHD. The Graduate School of Education and Human Development will spend the next 18 months creating programs to attract students and boost its research profile in the face of flagging enrollment and rankings. The school will create a path for undergraduates to earn their bachelor’s and master’s degrees in five years, as well as a new doctoral program focused on educational research. Both are part of a long-term plan to elevate the school’s status, dean Michael Feuer said. The changes, part of a strategic plan called “GSEHD Vision 2020,” will come at a critical time, as enrollment has dropped 22 percent in the last five years. The school has fallen from No. 19 in the country to No. 44 over the past decade in the annual U.S. News & World Report graduate school rankings. Feuer, who has run the school since 2010, said he hopes the accelerated master’s program would give undergraduates the opportunity to quickly get an in-depth preparation for an entire career in the classroom. The school could tap into the surging interest in teaching among undergraduates, Feuer said, pointing to the three dozen undergraduates who were accepted by the national teacher corps, Teach for America, last year. Six percent of graduates in the Class of 2011 went into education after graduation, according to data presented at a Faculty Senate meeting last year. “That tells me there’s a substantial pool, potentially, of GW undergraduates who are interested in teaching or for that matter in other aspects of education as a possible career move,” Feuer said. He plans to start reaching out to undergraduates this semester to gauge their interest and put the option out there, he added. The new doctoral degree would focus on education research, a hot topic in recent years as the cost of higher education has come to the forefront of national discussions. Students would dive into issues like the correlation between economic inequality and educational opportunity. A research-based degree would be a step away from the degrees focused on education and counseling, for which teachers focus primarily on practical skills. The Board of Trustees would ultimately need to approve the new degree. Feuer said the school would determine how to reallocate existing staff and money while shaping plans to be more efficient. “[We’re] trying to create more opportunities for cross-disciplinary collaboration that will bring in interesting grants. The Ph.D. program, but also within the Ed.D. program, we hope will attract a good bit of externally sponsored research,” he said. The school received $16 million in sponsored research last year, according to its website, which ranked the school at No. 19 in the country for research dollars per faculty member. The University pulled in $8.3 million in research funding from the Department of Education last year, 7.2 percent of GW’s total outside research dollars. A survey last summer by the National Council on Teacher Quality also gave the school zero of four stars, saying the school did not prepare graduates for teaching in the classroom. Feuer later said in a blog post that the school had not supplied the requested paperwork to the group, choosing not to participate in the review. Johns Hopkins University will offer a doctor of philosophy in education for the first time this fall, focusing on policy and learning outcomes at all grade levels. The University of North Carolina updated their Ph.D. program last fall to include specialized areas of research.